The Mumbai High Court today allowed 24 suspended Air-India pilots to join duty and operate flights but asked them to submit their replies to the charge-sheet served on them by the management explaining the reasons for refusal to operate flights. Taking a serious view of the Centre and states’ failure to implement the famine code to prevent starvation deaths in the country, the Supreme Court today ordered the Union Government to double cash and foodgrain allocations to states for the next three months under the Sampooran Gramin Rozgar Yojna to ensure immediate relief to the people below the poverty line. The Supreme Court today sought replies from the Centre and the National Aids Control Organisation about the monitoring mechanism and allocation of funds to a large number of NGOs under AIDS control programmes. Former Delhi High Court judge Shamit Mukherjee, arrested by the CBI in connection with the DDA scam case, today moved the High Court for bail after he was remanded in the bureau’s custody by a city court yesterday. 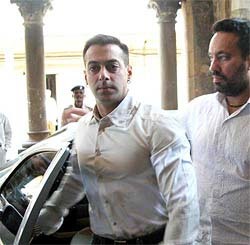 Holding film actor Salman Khan prima facie guilty of culpable homicide not amounting to murder in a hit-and-run case, a sessions court today rejected his plea to drop the charge and framed altogether 10 charges against him. The actor pleaded not guilty to the charges framed against him. He had rammed his vehicle into a bakery in suburban Bandra on September 28, killing one person and injuring four others who were sleeping outside. Suspected gangsters from eastern Uttar Pradesh shot dead Superintendent of Bhabua Sub-Jail Ram Parishan Ram at his residence in Kaimur district this morning, official sources said. Deputy Prime Minister L.K. Advani is understood to have taken a critical view of the VHP’s Trishul Diksha programme saying that it marred the organisation’s image even as efforts continued for evolving a consensus on key economic issues and Ayodhya on the second day of the Sangh Parivar conclave here today. Adopting a lenient approach in the politically-sensitive Kerala to the controversy over Rajya Sabha elections, Congress President Sonia Gandhi today decided not to take any disciplinary action against erring party MLAs and retained Mr K Muraleedharan as PCC chief. Only around 67 per cent households in Punjab have access to basic sanitation facilities, Minister of State for Environment and Forest Dilip Singh Ju Dev told Rajya Sabha in a written reply today. Uttar Pradesh developments rocked the Lok Sabha today with Samajwadi Party and Bahujan Samaj Party members clashing over the Mayawati government’s move to vacate the SP’s party office in Lucknow in violation of the court order. The BJP today attacked the Congress for remaining a “silent spectator” to the killing of BJP leader Satyanarayan Sinha in Patna and took exception to the language used by RJD leader Laloo Prasad Yadav while addressing the recent lathi rally there. The Himachal Pradesh Government has decided to rename the Koolar-Lohgarh road link in Nahan district as “Baba Banda Singh Bahadur Marg.” The Chairman of the National Commission for Minorities, Mr Tarlochan Singh, had urged the Himachal Government to rename the road link as Lohgarh was the capital of Baba Banda Singh Bahadur. Mr Justice M.N. Gokhale and Mr Justice D.G. Deshpande hearing a petition filed by the Indian Pilots Guild (IPG) and 24 suspended pilots said the court would decide on June 16 the issue whether their suspension was per se illegal. However, the court said the departmental inquiry would go on. 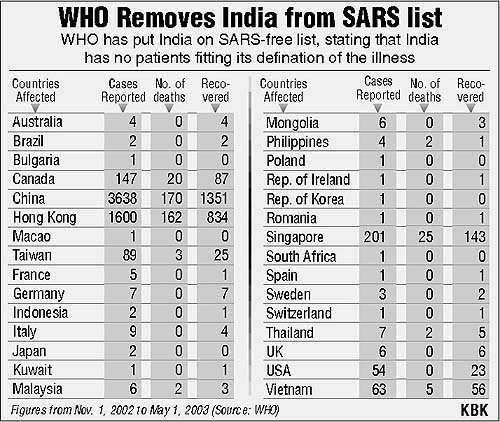 Outside the court, IPG general secretary Vikram Sansare told reporters that there was no reason now to refuse to fly to SARS-affected countries because sufficient precautions had been taken in this region. As regards the talks between a guild delegation and Union Labour Minister Sahib Singh Verma in Delhi yesterday, he said the minister assured them that he would consider their grievances in the next few days. Meanwhile, despite the calling off of the Air-India pilots’ strike, government stuck to its decision to derecognise IPG and disciplinary action against 45 suspended pilots while the airline said it would take at least a week time to resume original flight schedule. “There was no question of revising the stand on derecognising of the IPG which had caused a lot of financial and image loss to the airline,” highly placed sources in the Civil Aviation Ministry said in New Delhi. They said disciplinary proceedings against the 45 suspended pilots would be taken to its logical conclusion. In a move to send a stern message, the government has decided to continue with the disciplinary proceedings against Air-India pilots and derecognition of the Indian Pilots Guild. The week-long strike by the pilots was called off late last night "unconditionally". "The highest level of leadership in the government has decided to take tough action against striking pilots. The decision has not been taken solely by the Civil Aviation Ministry," official sources said. Fortyfive pilots were suspended for refusing to fly to SARS-affected destinations. Taking a serious view of the Centre and states’ failure to implement the famine code to prevent starvation deaths in the country, the Supreme Court today ordered the Union Government to double cash and foodgrain allocations to states for the next three months under the Sampooran Gramin Rozgar Yojna (SGRY) to ensure immediate relief to the people below the poverty line (BPL). “We direct that on pro rata basis, allocations under the SGRY be expanded and doubled, both in regard to foodgrains and cash, for May, June and July... and the states lift the allocations and ensure that the same reach those for whom these are meant,” a Bench comprising Mr Justice Y.K. Sabharwal and Mr Justice H.K. Sema in an order said. The Centre has made a provision of Rs 5,000 crore and 5,000 million tonnes of foodgrains to be allotted to the states under the SGRY this year and as per today’s order of the court the allocation for May, June and July would be calculated on the basis of double the amount. It would mean that the Centre would release to the states Rs 2,500 crore cash and 2.50 million tonnes of foodgrains during the next three months to overcome any drought and famine situation in the country. Stating that the Central Government had been sitting on an expert committee report on the implementation of the SGRY, the Antyodaya Ann Yojna and the Midday Meal scheme for primary schoolchildren, the Bench said whether the enhanced allocations should continue after July, would be considered by the court after the response of the Centre, which was asked to file an affidavit by August 8. It said the committee had recommended doubling of both the cash and foodgrain component under the SGRY. The direction was issued during the hearing of a public interest litigation (PIL) by the People’s Union of Civil Liberties (PUCL) alleging that despite the country having overflowing buffer stock of foodgrains, people were dying of hunger in many parts of the country. Asking the states to tighten the public distribution system to ensure that all families in the BPL category (estimated 41 per cent) were covered for distribution of subsidised foodgrains through fair price shops, the court said licences of shopkeepers be immediately cancelled if they were found guilty of selling the stock in the open market and making false entries of the allottees in their records. The Supreme Court today sought replies from the Centre and the National Aids Control Organisation (NACO) about the monitoring mechanism and allocation of funds to a large number of NGOs under AIDS control programmes. Issuing notices to the Union Ministry of Health and Family Welfare and NACO, a Bench comprising Chief Justice V. N. Khare and Mr Justice S. B. Sinha said they should submit the replies to a petition filed by the Common Cause, on NGO, and alleging that the money allocated to “mushrooming” NGOs under the AIDS control programmes was being grossly misused. The Common Cause, in a petition, filed by its counsel Kamini Jaiswal, said despite country spending Rs 1,000 crore on the AIDS prevention programme every year, government had failed to achieve any success to check the spread of the AIDS virus. While hearing his bail application, Mr Justice R.C. Chopra issued notice to the CBI, directing it to file its reply by May 5, when the matter would be taken up for hearing. The court also directed the CBI’s Investigating Officer, probing the DDA scam, to place before it the case diary on Monday for its perusal. Mr Justice Chopra said for deciding the bail plea, perusal of the case diary was necessary to see the progress made by the CBI in the investigation of the matter. Justice Mukherjee, who had resigned in the wake of the arrest of DDA Vice-Chairman Subhash Sharma and middleman Dharamveer Khatter, after his name had surfaced during the investigation, has sought bail on the grounds of ill-health of his wife and mother. A city court had yesterday remanded him in seven days’ custody of the CBI to facilitate his further interrogation. The CBI had alleged that four files relating to DDA cases, pending in his court, were recovered from the premises of Khatter. Holding film actor Salman Khan prima facie guilty of culpable homicide not amounting to murder in a hit-and-run case, a sessions court today rejected his plea to drop the charge and framed altogether 10 charges against him. The actor pleaded not guilty to the charges framed against him. He had rammed his vehicle into a bakery in suburban Bandra on September 28, killing one person and injuring four others who were sleeping outside. The court has posted the case for trial on July 2. Principal Judge A.J. Dholakia held that Salman appeared to be prima facie guilty of culpable homicide not amounting to murder as he had the knowledge that rash and negligent driving may kill people. Salman had opposed the charge of culpable homicide not amounting to murder, which attracts a maximum punishment of 10 years in jail. He argued that the case was that of rash and negligent driving for which the maximum punishment prescribed under the IPC was two years. Kaimur District Magistrate Mihir Kumar Singh said three miscreants riding on two motor cycles sprayed bullets on the jail Superintendent while he was sitting in his house after returning from a morning walk. He said at least five bullets were pumped into the temple and chest of the 55-year-old jail Superintendent killing him on the spot. The gangsters from neighbouring districts of Uttar Pradesh, who were recently released from the jail, were suspected to be behind Ram’s killing, the Magistrate said, adding that it appeared to be a pre-meditated murder. In his brief address to the meeting, Mr Advani is said to have posed a question saying that whether the VHP was acquiring the image of a trident distributing organisation and whether it was good for the outfit’s image, which had several “positive aspects” to its work, including ‘ekal vidyalayas’ (single teacher schools in remote areas), according to a participant. VHP International Working President Ashok Singhal and its firebrand Secretary-General Praveen Togadia sat silently and heard Mr Advani’s counsel, sources said. The sources said Swadeshi Jagran Manch leaders S. Gurumurthy and Murlidhar Rao expressed serious reservations over the government’s economic policies. Ayodhya issue also came up for discussion with the VHP leaders pleading for a parliamentary legislation to enable the construction of a Ram temple. Treating the episode as a “one-time aberration,” Ms Gandhi decided to give the erring MLAs, who had defied the party directive and voted for a rebel candidate put up by senior party leader K. Karunakaran, another chance to work for the unity of the party. The minister told the House that the percentage of such households was 60 per cent in Haryana, 43.2 per cent in Himachal Pradesh and 9.6 per cent in Jammu and Kashmir in 1997. FDI inflows: Finance Minister Jaswant Singh told the Lok Sabha that Chandigarh attracted Rs 842.5 crore of Foreign Direct Investment in 2002 (January-December). He said the major factor contributing to FDI concentration in certain states and UTs was the investment friendly climate there. Externally aided projects in Punjab: Minister of State for Finance and Company Affairs Anandrao V. Adsul told the Lok Sabha that there were four state sector externally aided projects under way in Punjab. For Punjab Afforestation Project, Japan had provided a loan worth 6,188.1 million Yen. Road, bridges projects sanctioned by Nabard: Nabard has sanctioned 339 rural road projects and 51 rural bridges projects for providing financial assistance to Punjab, Mr Adsul told the House. He said the number of such projects sanctioned by the bank were 62 (roads) and 29 (bridges) in case of Haryana and 227 for roads and 120 for bridges in Himachal Pradesh. As an SP member tried to raise the issue through adjournment motion, Speaker Manohar Joshi rejected it saying that the party can move court and state issues could not be raised in the House. Mr Ramji Lal Suman and Mr Kuwar Akhilish Singh submitted notice for the adjournment motion and also attempted to raise the issue in the House. All three adjournment motions were disallowed by the Speaker. Order in the House was restored after 10 minutes. Mr Suman contended that the democracy is being throttled by the Mayawati regime. His statement was contested by BSP members, including Mr Rashid Alvi. “The killing of BJP leader Satyanarayan Sinha and the language used by Mr Laloo Yadav only shows that the state should be brought under President’s rule. The Congress is equally responsible for these developments,” BJP Parliamentary Party spokesperson V. K. Malhotra told newspersons here. Mr Malhotra said a meeting of the NDA leaders was likely to be called soon to decide on the course of action to be taken to tackle the “civil war-like situation” in Bihar. The Chairman of the National Commission for Minorities, Mr Tarlochan Singh, had urged the Himachal Government to rename the road link as Lohgarh was the capital of Baba Banda Singh Bahadur. He was the first sovereign king to rule major parts of Punjab during the Mughal rule. Baba Banda Bahadur was named as chief of the Sikh army by Guru Gobind Singh in 1707. After entering Punjab, he defeated the Mughal army and selected this hillock near Nahan as his capital and built a fort there. The Union Government today saved the ceasefire with Dimacha militants by releasing 15 militants picked up by the Army three days ago. Prime Minister Atal Behari Vajpayee today released the commemorative postage stamp of late veteran journalist Durga Das here this evening. The Lucknow Bench of the Allahabad High Court hearing the Ram Janambhoomi-Babri Masjid title suit today granted the Archaeological Survey of India (ASI) an extension of 35 days to complete the excavation work at the acquired land in Ayodhya. The ASI was earlier given a May 10 deadline to complete the excavation work.